CALGARY – Titanium Corporation and Canadian Natural Resources (CNR) are reportedly teaming up to recover titanium and zircon from CNR’s oil sands tailings. The story was originally broken by CBC News. The two companies have proposed building a $400-million plant to retreat tailings from CNR’s Horizon mine near Fort McMurray. 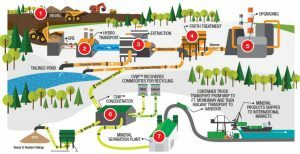 Such a facility has the potential to be profitable and could reduce the ecological footprint of oil sands waste. Titanium Corp. as been touting the idea of recovering titanium and zircon for more than a decade and already spent about $100 million on testing the technology. A flowsheet was developed in 2004 at the Saskatchewan Research Council. The flowsheet was fine tuned to recover the desired minerals from fresh tailings at the mouth of a pipeline rather than those that had already been deposited, and the first pilot plant concentrator ran in 2006. Research continued and in 2010, Titanium Corp. build a demonstration plant that treated tails from three oil sands producers. The plant recovered 75% of the contained bitumen and solvent as well as producing a cleaned heavy mineral concentrate. Emissions of volatile organic compounds, carbon dioxide, nitrous oxide, water use, and the need to thicken the tails were all reduced. Titanium Corp. has estimated the capex of a commercial plant to be $375 million with an internal rate of return of 20% and net present value of $290 million. Visit www.TitaniumCorporation.com to learn how this technology could sustain a new industry in Alberta.